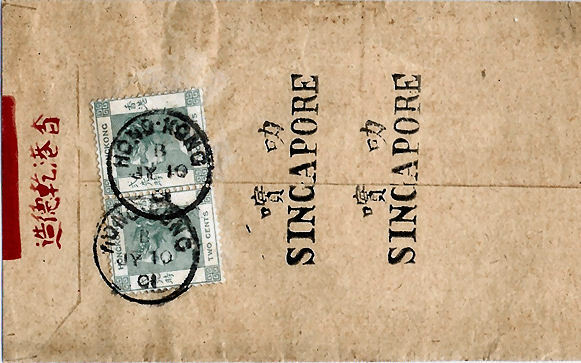 The Chinese equivalent of "Singapore" on the back of the envelope is 口+實叻. Since both characters have Kangxi radical 30 ("mouth"), they must be used for transcriptional purposes. Cf. "Spelling with Chinese character(istic)s, pt. 2" (6/16/16), which has to do with mouth radical-laden transcriptions circa 1800. The MSM pronunciation of 口+實叻 is shílè, which doesn't sound anything like "Singapore". Even if we change it to Minnan, which might well be the base topolect, it would be sitla̍t/le̍k, which makes it sound even less like "Singapore". Fortunately, we know that another early name for Singapore is 石叻 (MSM shílè; Minnan siah/sek lat/lek), which must be a variant of 口+實叻 (MSM shílè; Minnan sit lat/lek). Both 石叻 (MSM shílè; Minnan siah/sek lat/lek) and 口+實叻 (MSM shílè; Minnan sit lat/lek) must be Chinese transcriptions of Malay "silat" ("strait"). Overseas Chinese sometimes referred to Singapore as lèbù 叻埠, lit. "le port", taking the second syllable of 石叻 or 口+實叻 and joining it to a common word for "port". The current name for Singapore is from Sanskrit Siṁhapuram ("Lion City") < siṁhaḥ ("lion") + puram ("city"). As far back as the 3rd century, what is now Singapore was also known as Pulau Ujong, literally "island at the end" (of the Malay Peninsula) in Malay. Since there have never been any lions on the island, the apocryphal story of a lion sighting by an 11th century prince is unlikely as the historical origin of the name. It's been a while since I was at the exhibit, but I think there was some suggestion that "Siṃhapura" is a folk etymology? where "X" denotes the last character (which I don't recognise) on the middle line. But whatever it is, "收X" is most likely just a formal or more courteous term for "收". 萬安昌書柬 ("Man On Cheong Letter Writer") is the name of a professional letter writer (related: "When words are not enough: The dying art of professional letter writing"). 德生寶堂, the recipient shop, was probably a supplier to the Qing Imperial Court (王家官庒), according to this image on an auction site. This was a Hokkien transcription of Malay SELAT / SILAT. The exact pronunciation was Sítlát. This name was used colloquially into the 20th century. Interesting that the 1931 Taiwanese-Japanese dictionary included it, along with an alternate form 口＋實叻坡 (Sítlátpho). "Pho" is most likely from Indic -PURA ("-PORE"), but in Malayan Hokkien it can be used stand-alone to mean CITY.